“Whispering” Bob Harris is a DJ on Radio Two who plays folk music. I spent the first 10 years of my life listening to folk music, and I bloody hated every second of it. I think that’s why at the age of 13 I rebelled and got into house, hip hop and Bros (although at least I didn’t actually buy the Bros album, just borrowed it off my mate, honest). With the benefit of hindsight I will concede that folk music isn’t actually all that bad, in fact I like quite a lot of it, apart from Mumford and Sons, who are (in my humble opinion, and I’m sure they’re really nice people once you get to know them) crap. Anyway, Bob Harris started his radio career in 1970 presenting a programme called Sounds Of The Seventies, but it was axed in 1975, because nobody thought the Seventies would catch on. He then became a presenter on The Old Grey Whistle Test, in which he was the chief tester of old grey whistles. After that, Bob became a creepy Australian didge-fiddler (That’s Rolf! Ed. ), a ventriloquist with his fist up a duck’s bottom who sadly died recently (That’s Keith! Ed.) and an American actor who played Jackson Pollock (That’s Ed! Ed.) before the Radio Two folk show and now the pinnacle of his career – writing this crap game for the CSSCGC 2015. Right, now I’ve padded out the review with a “ha ha, this bloke’s got the same name as someone famous” bit (see also sunteam), here’s the game. Guess My Wait – do you see what he did there? – is a guessing game. 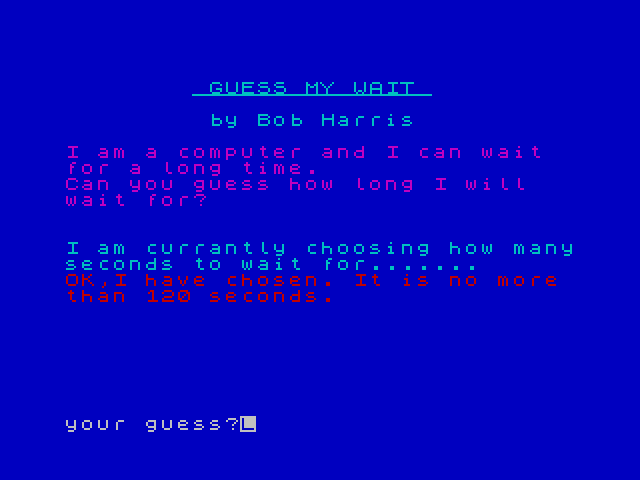 The computer waits for a bit, and you have to guess how long it waits for. Mmmmmm, currants. Might try them in my French biscuits next time I run out of raisons. It’s a bit like Watching Paint Dry, but even more boring and crap, which is what we like here at Sqij Towers. Pick a number from 1 to 120 and find out if you’ve guessed correctly. As a bonus, you get a BEEP every time the computer waits. Somehow Bob has managed to find a BEEP that gets more and more dirge-like the longer it goes on… and bugger me, it doesn’t half go on. If I was any more excited I think I’d wet my pants in two different ways. Score: 119 annoying dirgey BEEPs out of 120.